One of our favorite holidays traditions in New York City is visiting the "Big Tree." Last night the nation watched as the 2011 Rockefeller Center Christmas Tree was illuminated, and while we don&apos;t suggest braving the crowds the night of the lighting, we do think all little ones can celebrate the magic of the season by witnessing this tree. A little history...According to Wikipedia, the first official tree lighting took place in 1933 (the year the 30 Rockefeller Plaza opened). 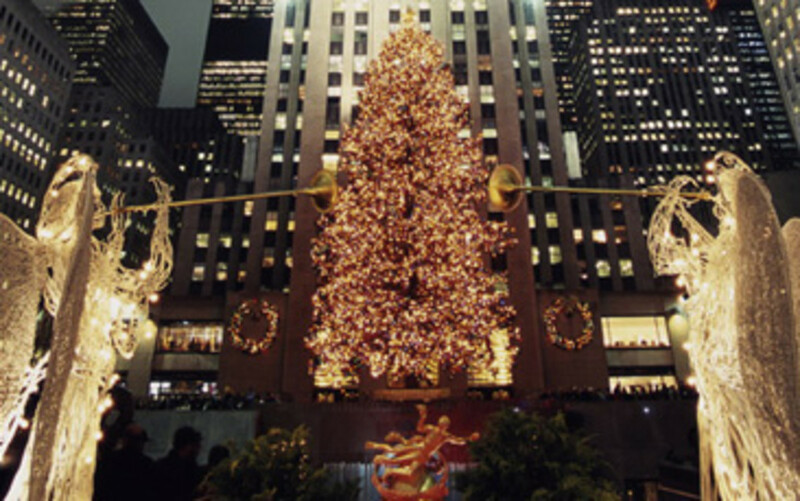 And the tallest Christmas tree arrived in 1999 at Rockefeller Center measured 100 feet. Erected in the middle of busy Rock Center the tree is illuminated by 30,000 environmentally friendly LED lights on five miles of wire, and crowned by a Swarovski crystal star. Our favorite time to visit is dusk, as folks are rushing to catch trains, we pull our stroller up to the tree and catch the spirit of the season. It&apos;s hard to pick which view is prettier, the tree or the awe-struck wonder of a child staring at the tree. When to visit: Daily 5:30am - 11:30pm, from now until the week after New Year&apos;s Day. We&apos;d advise skipping Saturday and Sunday afternoons. Monday from 5-9 is a perfect time for kids. What else to do: Grab hot cocoa from la Maison Du Chocolate (Rock Center at 49th) and go for a spin in the ice rink. This fuzzy one-piece is perfect for an evening out in a stroller or back-pack to watch the tree-lighting. It features fold over cuff feet and hands and an adorable elfin hood. Made from cozie fleece. Available in newborn ($43) and baby ($51) sizes and a variety of colors.